Language. 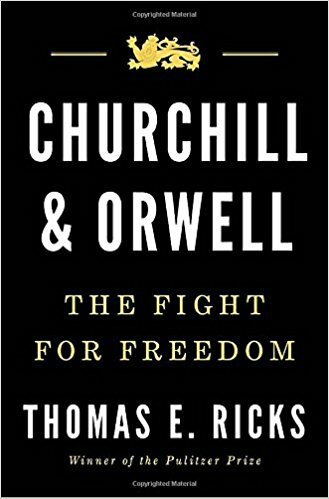 I’m glad that I spent a few days in early Summer reading Thomas E. Ricks’ book titled, Churchill and Orwell: The Fight for Freedom. I was curious to see what links Ricks would present to tie these interesting lives together. One of the connections involves their common love of language, and the ways in which their insight and words have an impact into the present. I knew far more about Churchill than Orwell, and thanks to Ricks I have an increased appreciation for Orwell. Readers interested in either individual are those most likely to enjoy this finely written book. Rating: Four-star (I like it) Click here to purchase Churchill and Orwell from amazon.com. Heartfelt. I’ve been listening to New York Times Book Review editor Pamela Paul on the NYT books podcast for a long time, so when I heard she wrote a memoir about her reading life, I knew I would read it. 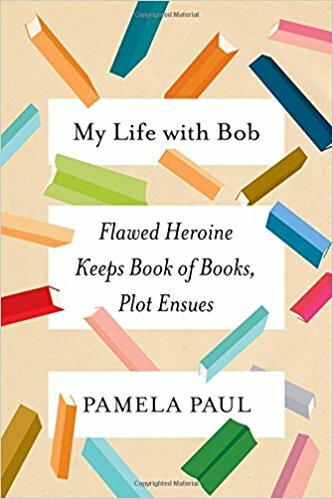 Titled, My Life with Bob: Flawed Heroine Keeps Book of Books, Plot Ensues, this is a candid memoir, written with lively prose, that uses the story of her Book of Books (Bob) as a way to talk about her life. I think book clubs might find this selection will stimulate discussion and reminiscence about books read and lives lived. Paul tells a heartfelt and personal story with lightness and humor and I read it quickly, not at all anxious that while I was reading this book I was not reading something else. Rating: Four-star (I like it) Click here to purchase My Life with Bob from amazon.com. Deported. 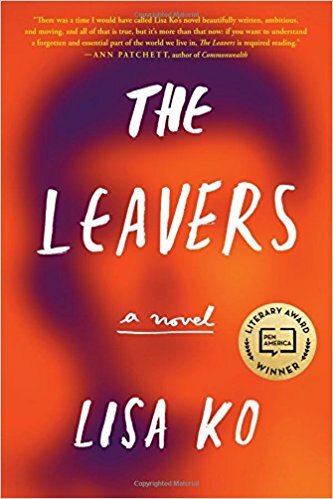 Lisa Ko’s debut novel titled, The Leavers, packs a wallop. Set in New York City and China, the novel tells the story of a mother, Polly, and her son, Deming, from both their perspectives. Polly became an undocumented immigrant who was deported to China, leaving Deming behind in New York where he is adopted and renamed Daniel. Ko presents the stories of Polly and Deming, their separation and reunion, with finely written prose and astute insight into the immigrant experience, especially the travail of the detention of undocumented workers. The emotional depth of the shared loss of years of separation for Polly and Deming is one of the strengths of this finely written novel. Rating: Four-star (I like it) Click here to purchase The Leavers from amazon.com. Reprise. Many people find themselves reflective around age fifty, and wistful about what might have been had alternative paths been chosen. 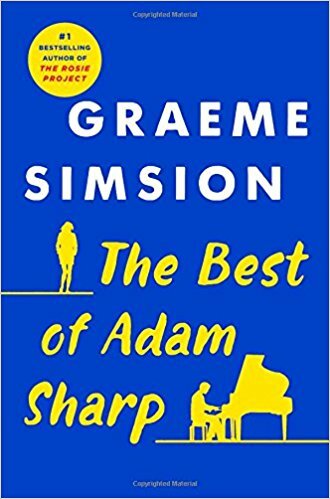 Graeme Simsion mines that topic in his novel titled, The Best of Adam Sharp. Protagonist Adam Sharp works as a computer consultant and has been in a long-term relationship with Claire, the sale of whose business might entail a move from the UK to the US. Having learned piano from his father, Adam has enjoyed music and piano playing for decades. While working in Australia in his youth, he was playing piano when he met and entered a passionate relationship with an actress, Angelina Brown. Out of the blue, Angelina makes contact, and Adam is drawn into all the possibilities of what might have been and what might still be. As in Simsion’s Rosie novels, the tone is sweet and the characters often endearing. Readers looking for light reading entertainment should consider this novel. Rating: Four-star (I like it) Click here to purchase The Best of Adam Sharp from amazon.com. Guts. I pay very little attention to science journalism, so occasionally I like to read a book that will explain something about science to me. 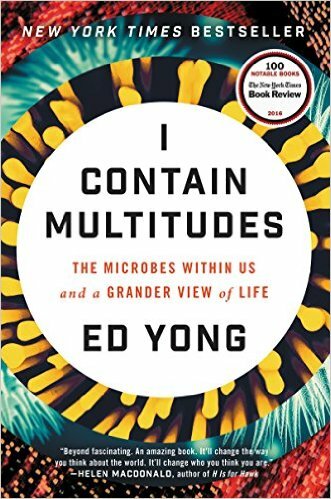 Timing can be everything in life, so it was with some irony that I read Ed Yong’s book titled, I Contain Multitudes: The Microbes Within Us and a Grander View of Life, while I was preparing for a routine colonoscopy. While I flushed away many of the microbes in my body, I learned lots of new things about them, and couldn’t wait for the procedure to end, so I could rebuild my personal microbiome. Whether your gut is filling or emptying, consider filling your mind with some of the latest scientific insight into the invisible world of microbes. Rating: Four-star (I like it) Click here to purchase I Contain Multitudes from amazon.com. Psychogenic. 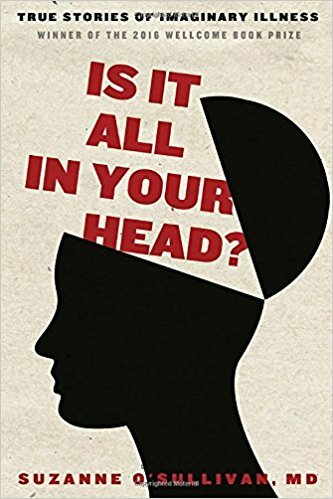 Dr. Suzanne O’Sullivan, a neurologist, has written an interesting and engaging book about psychogenic disease titled, Is It All In Your Head?. Spoiler alert: yes, it is in your head, but that doesn’t reduce the very real physical pain. In medicine and in society at large, there have been huge gaps in communicating effectively about psychosomatic illness. Through the cases presented in this book, O’Sullivan calls attention to the challenges of communicating effectively, and reveals her own shortcomings with different patients. Her overall treatment is sensitive and informative. The mind is a marvelous thing, and can exert significant control over the body in ways that become debilitating. Health care professionals or general readers interested in medicine or the mind are those most likely to enjoy reading this book. Rating: Four-star (I like it) Click here to purchase Is It All in Your Head from amazon.com. Cravath. 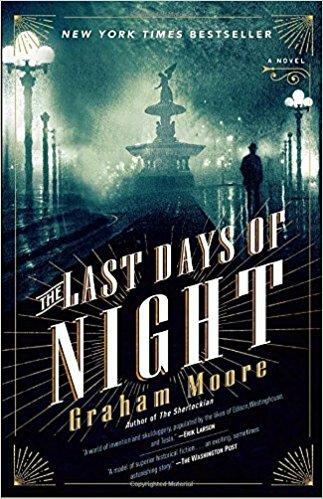 Fans of historical fiction that doesn’t stray far from fact are those most likely to enjoy reading Graham Moore’s novel titled, The Last Days of Night. Set in the 1890s, the novel features a large cast of well-known characters including George Westinghouse, Thomas Edison, Nicola Tesla, J.P. Morgan and Alexander Graham Bell. The protagonist is young lawyer Paul Cravath whose name may be known to many, but whose life hasn’t been written about often. Cravath is hired by Westinghouse to defend his company in lawsuits with Edison over light bulb patents. Moore captures the excitement of the time when inventions were proliferating and fortunes were being made. Moore even makes the lawsuits exciting. The pace of the novel is quicker than most thrillers, and I was enthralled and entertained from beginning to end. A friend who is an attorney recommended this novel, and I put it at the top of my queue. I never would have guessed on my own that a lawyer could have been such an interesting character. Rating: Four-star (I like it) Click here to purchase The Last Days of Night from amazon.com. Standup. 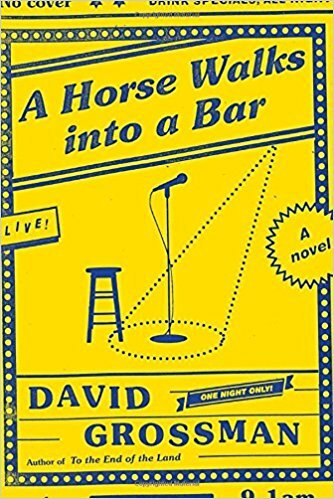 After I finished reading David Grossman’s novel titled, A Horse Walks into a Bar, I was as physically drained as I am after a heavy workout at the gym. The structure of the novel covers one night, the bulk of which we observe as protagonist Doveleh Greenstein performs a standup comedy routine for an audience in Netanya. Dov’s shtick is funny at times, but he is not an endearing character, and much of his humor is dark. I might have been one of the audience members to leave the show. Personal reflections on his life get darker as he describes life with a Holocaust survivor mother and a detached father. Grossman won the Man Booker International Prize for this novel. My guess is that the raw, unremitting truth and the efficient writing appealed to the judges who recognized Grossman’s great skill. Get a good rest before reading this novel, because Dov leaves everything on the stage before he ends his standup and being an audience member listening to him can become physically draining. Rating: Four-star (I like it) Click here to purchase A Horse Walks into a Bar from amazon.com. Resistance. 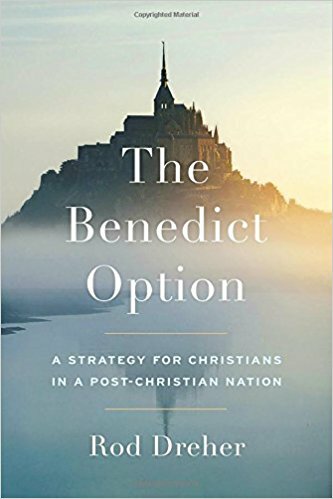 Ron Dreher proposes a radical form of community life for Christians in his book titled, The Benedict Option: A Strategy for Christians in a Post-Christian Nation. Instead of struggling to raise our children to not conform to the values they discern from secular culture, Dreher proposes forming communities of individuals with shared values. This call to community life has a long history which Dreher describes. While he belongs to the Eastern Orthodox Church, his message can apply to any believer struggling with the challenges of how to live a Christian life in a secular culture. Living in and not of the world has a long tradition, and whether a reader agrees with Dreher’s analysis and advice or not, most engaged Christians will find serious points for personal and communal consideration in this book. Non-Christians who wonder what all the fuss is about will also find clarity on some issues in this book. Rating: Four-star (I like it) Click here to purchase The Benedict Option from amazon.com. Dance. 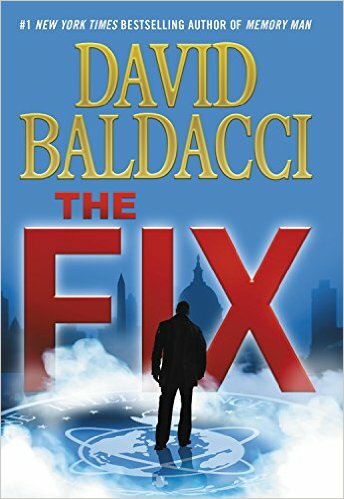 The third novel in a series by David Baldacci to feature protagonist Amos Decker is titled, The Fix. Fans of this series will enjoy the continuity from the last novel and the setup for the next one. I see this continuity and setup as the dance between the serial author and readers: for some dance partners the pace is too slow and for others the dance never lasts long enough. I was entertained by this novel, mostly because I think Amos Decker is a very interesting character, and he continues to develop in this novel in interesting ways. The dance for me was neither too fast nor too slow. The series moved on incrementally, and I look forward to another installment. Fans of Baldacci novels, whether this series or others, are those most likely to enjoy reading this novel. Rating: Four-star (I like it) Click here to purchase The Fix from amazon.com. Changes. 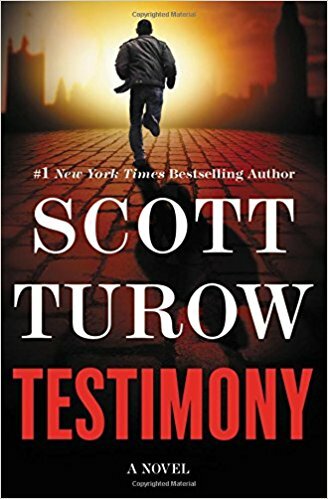 One of the many things I like about Scott Turow’s legal thrillers is that the author always respects the intelligence of readers. In a new novel titled, Testimony, Turow describes the work of the International Criminal Court in The Hague and a case involving possible war crimes in Bosnia. Protagonist Bill ten Boom has embarked on several life changes at age fifty: leaving his wife, his law career and his country. Turow develops Boom with great skill, drawing readers into understanding of this character. A supporting cast of characters are also well-drawn and animate a plot that’s engaging, although slowed on occasion with expositional details about the court and war crimes. Fans of Turow are likely to zip through this novel quickly, and any reader who enjoys legal thrillers may find this novel among the best in the genre. Rating: Four-star (I like it) Click here to purchase Testimony from amazon.com. Custodian. Did you know that even a prolific writer like Stephen King gets writer’s block? After telling fellow author Richard Chizmar that he was having trouble finishing a story, King accepted Chizmar’s offer to show him the story. What followed was a back and forth email exchange with both writers contributing to a novella titled, Gwendy's Button Box. Set in Castle Rock, Maine, the novel presents protagonist Gwendy Peterson who becomes the custodian for a time of a magical button box that has the capability to deliver both good and evil. King and Chizmar tackle coming of age, power, trust and responsibility in this short novel. I read it quickly and enjoyed every page. Rating: Four-star (I like it) Click here to purchase Gwendy’s Button Box from amazon.com. Succinct. 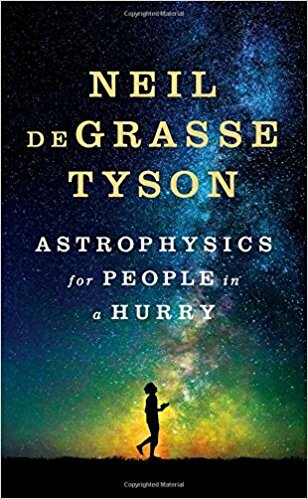 While I am no hurry when I read, I appreciate the concise prose by Neil deGrasse Tyson in his book titled, Astrophysics for People in a Hurry. Rather than dumbing down the content, Tyson presents astrophysics in a concise way. I found myself reading a chapter and then setting the book aside before starting another chapter. I finished this book still unable to teach astrophysics, but I am better informed for the next article I read, and when I run into the neighbor who heads a university physics department, I won’t be totally confused in a conversation. Any reader with a general interest in science will likely enjoy this book. Rating: Four-star (I like it) Click here to purchase Astrophysics for People in a Hurry from amazon.com. Transformation. As a casual reader of history, I gravitate toward books that synthesize and lean away from those that present detailed specialization. 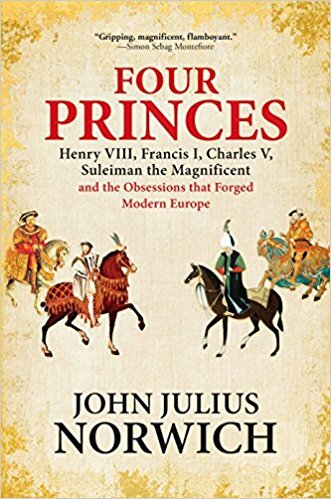 I was captivated by John Julius Norwich’s focus on the early 16th century titled, Four Princes: Henry VIII, Francis I, Charles V, Suleiman the Magnificent and the Obsessions that Forged Modern Europe. I enjoy the ways in which this talented historian connected these four rulers and explained with clarity how they led a dramatic transformation on the continent. I knew many things about each of these rulers before reading this book, but Norwich connected them in my brain and helped me understand what was happening in different parts of Europe at the same time. Rating: Four-star (I like it) Click here to purchase Four Princes from amazon.com. Variety. The seven short stories in Haruki Murakami’s collection titled, Men Without Women, provide readers with a variety of perspectives on male alienation. Each story offers a close look at interesting characters and the ways they live in the world. I love Murakami’s humor and the ways in which he calls attention to details that we can easily overlook. Readers who enjoy Murakami, literary fiction, and especially short stories, are those most likely to enjoy this finely written collection. Rating: Four-star (I like it) Click here to purchase Men Without Women from amazon.com. Orphan. 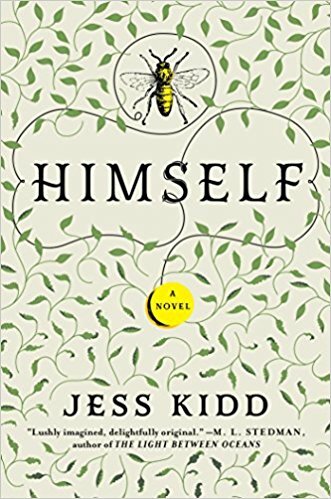 When I noted that Jess Kidd begins her debut novel, Himself, with a stranger coming to town, I sensed that life in the town was about to be disrupted. Protagonist Mahony was left at an orphanage as a baby, and when he left Dublin for the village of Mulderrig, what he thought he knew about his mother, Orla Sweeney, begins to change. Kidd pairs Mahony with an interesting cast of collaborators, living and dead, who turn the village upside down in a search for understanding. I enjoyed the dark comedy and the finely told story that entertained me thoroughly from beginning to end. Rating: Four-star (I like it) Click here to purchase Himself from amazon.com. Kansas. 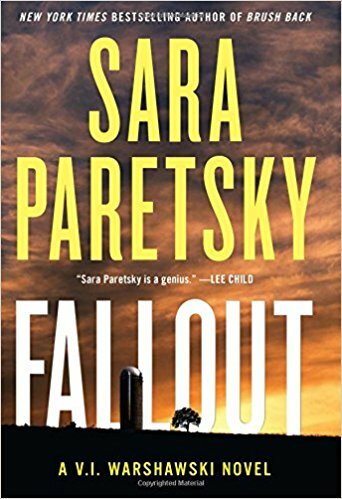 The nineteenth novel in Sara Paretsky’s V.I. Warshawski series takes the private detective out of Chicago for a case in Kansas. In this book titled, Fallout, V.I. learns that events in the past provide the key to solving the case that led her to Kansas: the disappearance of a film student and an actress. Longtime fans of the series will enjoy spending time with Vic again, and watching so many plot lines get teased out and eventually resolved. Dog fans will love that Peppy joined Vic on the outing to Kansas. Rating: Four-star (I like it) Click here to purchase Fallout from amazon.com. Deception. 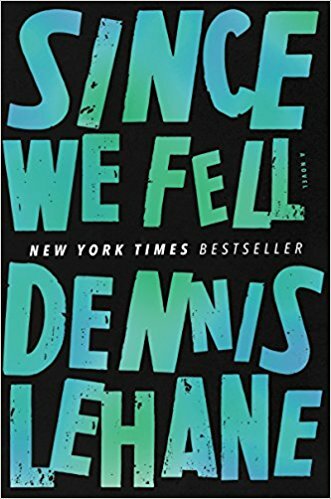 Appearances are deceiving throughout Dennis Lehane’s novel titled, Since We Fell. Fans of Lehane will love the ways in which he develops interesting and complex characters, moving them through a thrilling plot full of twists, while offering deep psychological insight along the way. Rachel Childs will be a memorable protagonist for most readers. Any single impression of Rachel will be proven to be grossly incomplete. Readers who can tolerate shocking violence and who enjoy psychological thrillers are those most likely to enjoy this novel. Rating: Four-star (I like it) Click here to purchase Since We Fell from amazon.com. Skin. 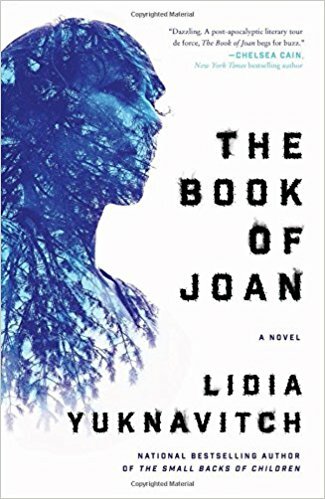 Fans of dystopian post-apocalyptic fiction are those readers most likely to enjoy reading Lidia Yuknavitch’s novel titled, The Book of Joan. Set in 2049, most of Earth has been destroyed, and a wealthy cohort lives in a complex orbiting the planet and trying to steward resources to adapt and survive. Body modification involves odd skin grafts and telling stories on skin, one of which is an updated story of Joan of Dark, who fought against Jean de Men. Yuknavitch’s prose shows off her literary skills and fans of literary fiction will appreciate her well-chosen words and phrases. Rating: Three-star (It’s ok) Click here to purchase The Book of Joan from amazon.com. Doctor. 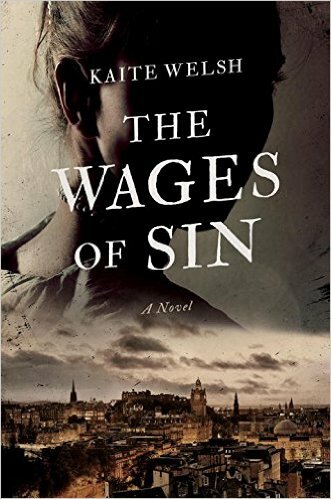 Kaite Welsh’s debut novel titled, The Wages of Sin, introduces readers to a great protagonist, Sarah Gilchrist, a medical student in Edinburgh in the 1890s. This novel will appeal to readers who love character-based descriptive historical fiction. Sarah faces the obstacles that women of her time encountered especially at a medical school that “welcomed” her in its first coed class in 1892. Many readers will want Welsh to reprise Sarah in future novels. Rating: Four-star (I like it) Click here to purchase The Wages of Sin from amazon.com. Viewpoints. 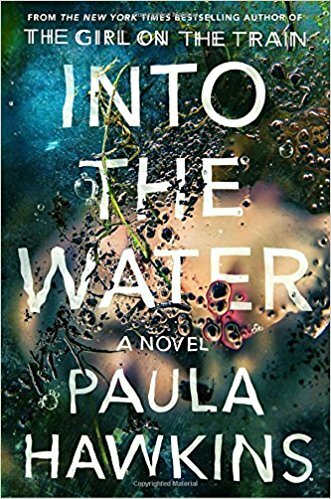 Every time I allowed my attention to drift while reading Paula Hawkins’ novel titled, Into the Water, I was punished when I realized I lost track of what time period the narrative was in and whose viewpoint was being exposed. After the third time I had to re-read pages, Hawkins kept me alert with my full attention as the novel demands keeping track of a large cast of characters and different deaths at different times. The reward for this close reader was a delightful feeling of satisfaction when all the mysteries were solved. Fans of complicated plots and large casts of characters who all contribute important elements to the story, are those readers most likely to enjoy reading this complicated and entertaining mystery. Rating: Four-star (I like it) Click here to purchase Into the Water from amazon.com. Perspective. When a great novelist who has developed a protagonist with great depth over multiple novels turns to memoir, readers can wonder if the same depth and insight will be found in nonfiction. 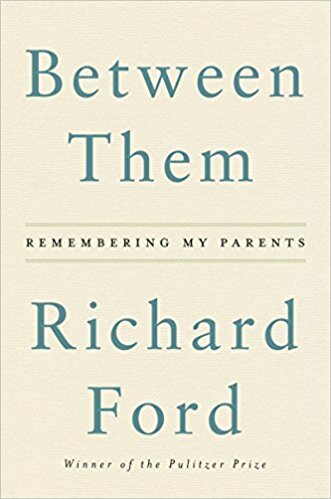 Richard Ford has written two memoirs about his parents, and combined them in a volume titled, Between Them: Remembering My Parents. One memoir was written decades ago; the other recently. Both offer the perspective of an only child, who observed his parents from his special place in their lives. Rather than complexity of character and depth, we see reflection and the result of observation over decades. Ford’s prose is finely written, and any reader who enjoys memoirs, or who is a fan of Ford, will find much to enjoy in this book. Rating: Four-star (I like it) Click here to purchase Between Them from amazon.com. Primer. 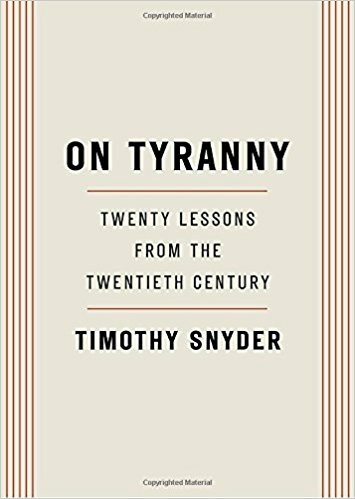 Yale history professor Timothy Snyder offers readers a short book titled, On Tyranny: Twenty Lessons from the Twentieth Century, that provides a primer on what the recent century might teach us about what is necessary to be done today. Any engaged citizen with concerns about our current political environment can spend a worthwhile half hour reading the lessons that Snyder offers. Whether you think our current divisive politics is a feature or a bug, there’s much to reflect on in this short volume. You may disagree with Snyder, but spending a few minutes thinking about this topic will be time well spent. Rating: Four-star (I like it) Click here to purchase On Tyranny from amazon.com. Biotech. 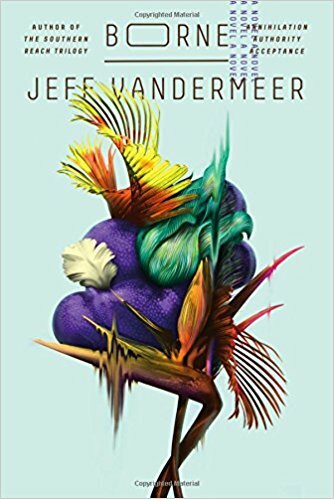 If a dose of dystopian fiction is on your reading menu, consider reading Jeff VanderMeer’s novel titled, Borne. A biotech firm called The Company, has wreaked havoc on a city with the results of its experiments. VanderMeer uses protagonist Rachel as our avatar living in this hostile environment. Questions of morality, including what it means to be human, elevate this novel above being just another futuristic exploration of a damaged world. Rating: Four-star (I like it) Click here to purchase Borne from amazon.com. Language. 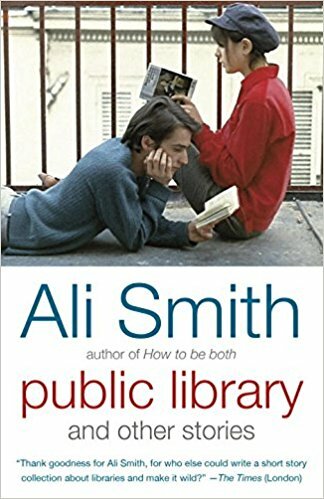 Having read other works by Ali Smith, I was prepared for the pleasure of falling under the spell of her wordplay in a collection titled, Public Library and Other Stories. Smith’s skill with words can become dazzling, and at the same time make some readers feel unmoored. Words, books and libraries are all on display in this collection, and those readers who love our language are those most likely to enjoy reading this book. Rating: Four-star (I like it) Click here to purchase Public Library from amazon.com.